Click the button below to add the ENGINE ASM, 350HP CIRCLE TRACK to your wish list. Chevrolet Performance’s CT350 delivers 350 horsepower from a classic 350 cubic-inch combination. It’s just the thing budget-conscious racers can depend on for competitive performance and low-maintenance durability. The CT350 is based on the popular 350 HO high-performance street crate engine, including a stout four-bolt main block and Vortec-style iron cylinder heads. 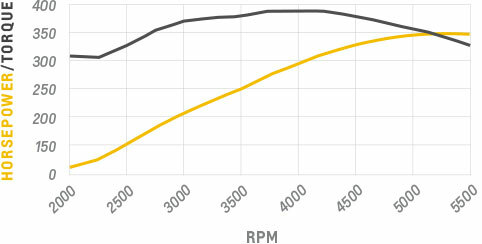 The Vortec heads and unique dual-pattern camshaft help deliver more than 300 lb-ft of torque at 2000 rpm and hold it above that mark through 5500 rpm — it peaks at 390 lb-ft at 3800 rpm. With that much pulling power, you can hold a gear longer, keeping the engine in its sweet spot for quicker laps. We complete the CT350 with an 8-quart Circle Track racing oil pan, balancer, HEI distributor, and an aluminum high-rise, dual-plane intake manifold. Add your carburetor, starter, spark plugs, wires, and water pump — all available at chevroletperformance.com — and you’ll be ready to roll into the winner’s circle!